New in LibCal: the Hours Module is here! Unlike our last post, this post is no joke! We’re really excited to announce a big new LibCal feature – the Hours module is here! We’ve fielded lots of questions from LibCal users on customizing the calendar display to show open hours for libraries and library departments. We decided to create a new module in LibCal just for this purpose – hence, the Hours module was born! Hours Templates – Simplify the process of displaying library hours – create templates for different libraries, services, branches, and time periods (like Semester Hours, Holiday Hours, etc.). Open Past Midnight? – No problem! The Hours Module handles any and all time spans with ease. Today’s Hours – Live in the now! Display today’s hours with a simple API call. 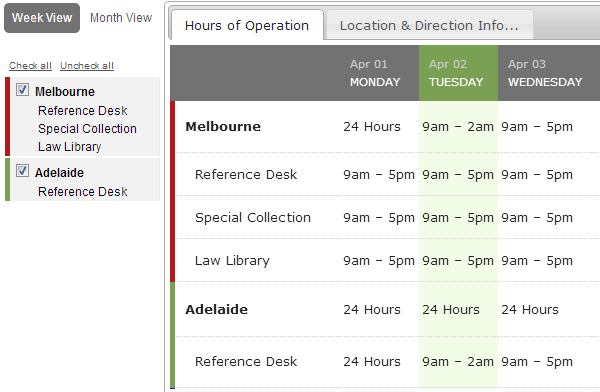 Weekly Grid View – Show hours for multiple libraries and locations in one beautiful display. Monthly Calendar View – Display a full month’s hours on one screen. Ready for a better way to manage your library hours? Head to Admin Stuff -> Hours to get started! For more help with setting up this new feature, head to our help guide. And as always, thanks a million for your ideas and feedback! *Sites on any of our paid pricing tiers have access to unlimited libraries and departments; 3-for-free sites can manage hours for a single library. I’ve just tried this – some of the widget codes don’t seem to work; I just want to show Today’s Hours, and the generated code is http://api.libcal.com/api_hours_today.php?iid=45&lid=203&format=html but that shows as the text rather than the actual library hours. Am I doing something wrong? (though don’t think so, as the weekly one works, but that’s too wide to fit in the space I have available). HTML: For processing via a web-script (PHP, ASP, AJAX, etc) or embedding directly in the page using an iframe. JSON: For processing via a script. XML: For processing via a script. Is there a way to insert a or (better yet) omit the library name altogether?